1. How do I enquire about the upcoming Training Programs? 2. What are the Trainings offered for Corporate Companies? We offer many Leadership and managerial development programs. A few of the programs are ; First time managers, NLP @Work, Soft Skills training, Design thinking, HR Assessments, Team Building /outbound Learning Programs. 3. What are the Trainings offered for Individuals? 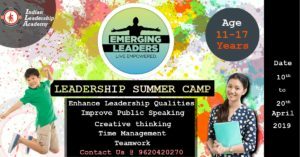 NLP Workshops, Certified Trainer workshops ( Train the Trainer), First time manager, Coach the Coach Certification program, Leadership Development Programs for Youth, Family workshop etc. 4.	Who are the Trainers? What qualifications do the trainers have to facilitate these classes? You can go to our About us page for viewing our Trainers Profile. The trainers have 10 -25 years of work experience in the training industry and has got global exposure in training and coaching. 5. Is the Training material provided during the Training? Yes, the hard copy of Course content will be provided on the First Day of Training. 6.Where will the Training be held? 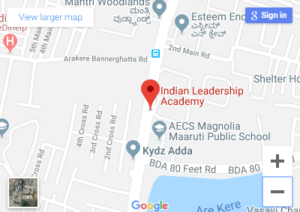 Our Public Workshops in Bangalore will be Held at Indian leadership Academy Campus @ Bannerghatta Road. Trainings venues may vary in different cities. 7.What are the modes of Training? All of the Public Workshops are classroom based Training. Online training and coaching is Done on request. 8. Do you provide any group Discounts? Yes, We do Provide group discounts. Contact us to know more. 9. What are the payment options? Bank Cheques are accepted. We do not accept Post Dated Cheques or Promissory notes. 10. Where can I Find the testimonials? 11. Will I receive a certification after completing this course? Yes, After completing the Training Program the participant will receive a certificate from Indian leadership academy. 12. My business delivers training, how can I become a featured training provider? Contact us or write to us to know more. 13. I want to own a Franchisee of ILA. How do I Proceed with this? Contact us or write us to know more. 14. Are there any career opportunities right now at ILA? We have a passion for coaching and training, and we are always on the lookout for like-minded individuals .Even if you are exploring new avenues in the training field or you are an established professional .Send us an email at support@indianleadershipacademy.com with your detailed resume and we will be in touch shortly.